As we wrap up January, I wanted to share with all of you some of my favorite client moments of this month. 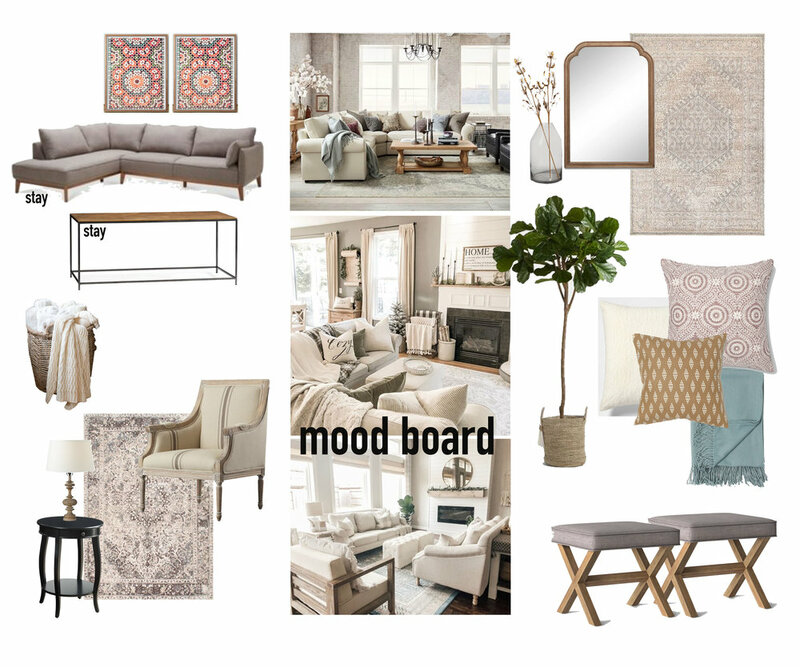 The visual communication that a mood board helps me give to my clients is magical. It gives a feeling and a sense of the design before I really start honing in. It’s the best way for us to talk creatively when the client may still be unsure of what they want. It serves as a ‘let me show you’ tool that I can’t live without, especially this month. I sourced this bench for a mudroom space. This particular room had traffic flow from multiple directions and needed a little anchor. It’s the perfect functional piece of furniture that also creates its own moment. This fireplace currently has a single oversized text piece on the mantle that the homeowner was struggling to replace. I sourced and styled some new pieces for a ‘Pottery Barn’ layered look. I think we hit the nail on the head and I love how it turned out. Never underestimate what you can do with a small budget. This living room space by Studio McGee was my favorite inspiration image this year. I love when natural elements tell the color story and no one does that better than Ms. Shea McGee. Lastly, this living room rendering topped my favorites chart this month. All in, it wasn’t a drastic change from where her space started, but with a small budget and a little creativity, we warmed the space up with a mix of textures, pattern, and cozy feels. This month I also bought tickets to Rachel Hollis’s RISE Conference in Dallas in July. My Mom and I are making the trip from Philadelphia and we couldn’t be more excited to soak it all in. In summary, January, you were so good to me. To put this month into perspective, in the entire 2018 year I worked with five clients, and in January 2019 I worked with six new clients. Big things are coming and this is just the start, I hope you come back to see more throughout the year.